No Chew For You, Athletes In Boston (If The Mayor Gets His Way) A proposed ordinance would ban the use of smokeless tobacco at sports facilities across the city. If approved it would cover everything from Little League fields to games at Fenway Park. 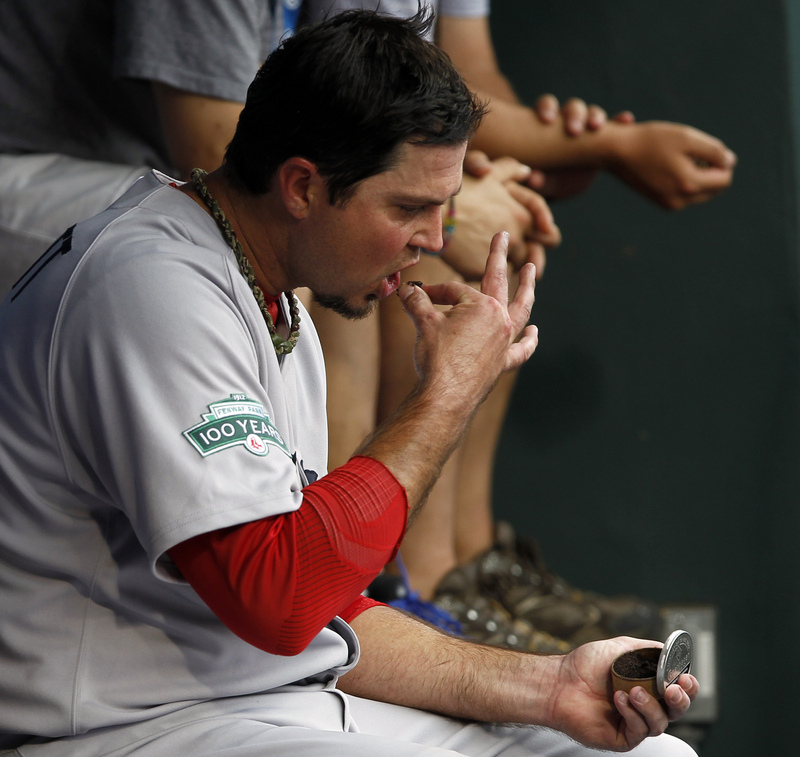 Boston Red Sox starting pitcher Josh Beckett inserts smokeless tobacco as he sits on the bench after being relieved during the eighth inning of a 2012 interleague game against the Philadelphia Phillies. According to Myers, cigarettes faded out of baseball over time, but smokeless tobacco — such as chew or dip — didn't. These days, fewer players use it, but they're still allowed to chew it on the field, and many do. Now, Boston Mayor Marty Walsh wants to change that. "A lot of kids see these ballplayers chewing," the mayor says, "and a lot of them start chewing at a young age because they think that's part of the game." On Monday, Walsh filed an ordinance that would ban smokeless tobacco at every athletic facility in Boston. If the City Council approves it, the ban would cover everything from Little League fields all the way up to Red Sox games at Fenway Park. "The Red Sox and Red Sox players happen to be part of a catch area here for this, but the real focus is on education and prevention for young people chewing and getting into serious problems," he says. Walsh hopes that if kids don't see their heroes chewing, fewer of them will have an incentive to start. The Major League Baseball Players Association declined to comment on the proposed ordinance. In the past it has fought for players to have the right to chew on the field. But some players won't have a choice. San Francisco passed a similar law earlier this year, and a Los Angeles city councilman says he'll propose one in a few months. Boston's proposal would fine anybody caught chewing at a game $250. If the City Council passes the ordinance, it will take effect next April, just in time for baseball season.